Most of us want to become leaders but there's other jobs, business, family or social groups. We all like to feel respected and listened to, we like to feel powerful. But what if I tell you, leadership is not as most of us imagined. Leadership is more than just a position, it's a process, it's not something that you achieve and you have forever. It's something that is always evolving and changing. Leadership is more than just having people listen to you but to develop influence and ultimately change that will benefit everyone. In the book the five levels of leadership, we learn the principles of leadership and why leadership is not just all black and white. John Maxwell shows us the different levels of leadership and the different levels of influence that come with them. This right is given to you by a position, whether it's a job title or you're the owner of your company. In the first level, people follow you because they have to. If you're the CEO of your company people will listen to you and fear of being fired. The first level of leadership is. In real leadership at all because at this level you don't have any influence you just have a higher ranked position and the position doesn't make the leader. Have you ever had a boss that wasn't a very good leader? This is one of the reasons why in the first level people will give you the least amount of their time and effort because they follow you only because they have to. Here's where you focus on building relationships. Once you step into the second level of leadership people don't just follow you because they have to, they follow you because they want to. In this level you focus on getting to know your people, you understand who they are and you build a good relationship with them. Here you're not only their supervisor or manager or boss you are their leader they actually like you. Their conscience of where they are with people. Not everyone responds the same to you and great leaders are always aware of who they're talking to and the responses they're getting. True leaders know that leading is not a noun but a verb and they constantly improve their skills. They have an attitude of servitude and they love to serve. The main difference between a boss and a leader is that people serve bosses and leaders serve people. This is where you become effective and productive and this is where you get results. Here's where you lead people by setting them an example and in order to be a level 3 leader you have to have done what you've asked you, people, to do. Here people follow you because you get results, if you want your people to be productive you have to be productive if you want people to be organized you have to be organized. In this level you start to develop momentum and momentum is a leader’s best friend. Many of the problems an organization has can be solved with momentum. A great example John Maxwell uses for this is to picture a train going 60 miles per hour. This train has momentum and even if you put a 5-inch thick concrete wall in front of it it'll just go through it without any problem. But the same train when it's not moving without any momentum you can put a 2-inch block on its wheels and now the Train can't even get started because it has no momentum. To grow your company you will need to grow people. In this level, you give your people the tools to equip them to become better at what they do. They find people who are willing to grow and become better. Be positioned their people in a place where they can thrive. They're aware of their people's strengths and weaknesses and they give them the tools and knowledge to be the most effective. As a level 4 leader, you will need to learn and master the skills you're teaching in order to equip other people well or get a leader at that level that has the experience that you don't. Because you can teach what you know but you will only reproduce who you are. In this level you mentor people, you show them and teach them what you know. You develop their skills and their abilities to become highly effective at their craft. But level 4 doesn't end here, you have not completed that people development level until those people that you have developed are able to develop others. This is where real exponential growth happens whether it's in your own business or you work with another company, when you are able to develop people who can teach and develop others, you have created a powerful organization that grows exponentially. As Maxwell says you don't grow companies you grow people. Here you're not only impacting the business and organization but you're impacting people's lives, you are developing people to become more skilled and to become leaders themselves. This is what you've done many things, for many people for a long time here people follow you because of who you are in what you represent. This takes a lifetime to achieve, most people at this level achieve this later in their career because they have influenced massive levels of growth and they have built an environment and a culture that will be passed on from leader to leader, from mentor to mentee. At this level, they have created a legacy that will continue to grow. The five levels of leadership aren't much of a ladder that you have to climb as much as skills that you have to build upon each other. Great leaders know that they will have to constantly work to be a leader because they know that they are not on the same level with everyone. 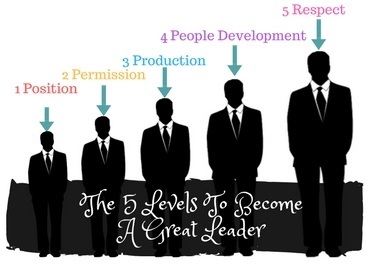 A leader you cannot say I am a level 4 leader with everyone because if a new person comes into your company you are back to level 1 with them and you will have to develop a relationship and go through the levels of leadership all over again. Because people will respond differently to you according to the level of leadership you have with them but the higher you go the easier it becomes to lead. As a level 1 leader, you will get the minimum amount of energy from your people. At level 5 you will have much more time and commitment from others because you've done just as much to develop them. They like you, they respect you and they admire you for what you've done for them. Developing yourself as a leader is extremely important because people follow leaders who are stronger than they are and if you stay at a level 2 leader you cannot attract the level 3 leaders for your team, they will not follow you.